Evan Floyd from Tallahassee, Fl. caught this BIG bass on a live wild shiner today while fishing with Okeechobee Bass Fishing/Shellen Guide Service. 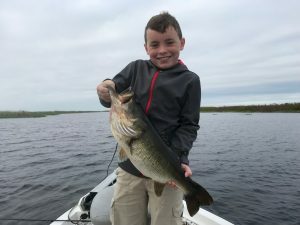 Evan is 9 yrs old he and his dad caught 35 fish total. The overcast weather was perfect for a great day of fishing.